Successfully Added 5 Antenna Cell Phone Jammer with Remote Control (3G, GSM, CDMA, DCS) to your Shopping Cart. For absolute jamming of any cell phone signal, there is no stronger or more efficient solution than the 5 Antenna Cell Phone Jammer with Remote Control. This high quality device provides you with 10 Watts of output power and 5 powerful high gain antennas to completely block all mobile phone signals within 50 meters. When complete cell phone silence is needed, this 5 Antenna Cell Phone Jammer with Remote Control is the answer. With its five high gain antennas, you get industrial-strength frequency jamming that is powerful enough to disrupt all cell phone signals (3G, GSM, CDMA, DCS). It also provides 10 Watts of output power that will even jam the strongest signals, which usually cannot be stopped by the lower 3-5 Watt versions. This 5 Antenna Cell Phone Jammer also comes with a remote control that lets you turn the device on and off for instant jamming and unjamming. It even has sensitivity control for partial and selective blocking of any mobile phone signal. 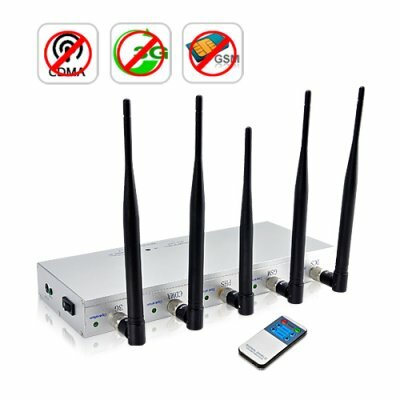 Want to allow 3G signals but block all GSM signals? You got it. With a working radius of up to 50 meters, this device can be used in any location and even mounted on the wall thanks to the mounting plate and included accessories. Just put it in places where a phone call would be particularly disruptive because silence is expected or needed, and you'll get instant, remote-controlled jamming. For example business meetings, legal proceedings, churches, hospitals, movie theaters, class rooms, etc. Best of all, this 5 Antenna Cell Phone Jammer will not interfere with other electronic equipment in any way! The demand for wireless control devices and jammers is growing very rapidly and this 5 Antenna Cell Phone Jammer with Remote Control is one of the best! Catch some extra sales for yourself by featuring this new Cell Phone Jammer on your webshop frontpage today! From the leader in direct from China wholesale electronics - Chinavasion. How could this jammer possibly disrupt 3G cell phone signals when the 3G frequency of 2100 MHz falls outside of this jammer's affected frequency range of 2110-2170MHz range? Though 3G cellphones reportedly operate at 2100 MHz, the number has actually been rounded down for the sake of convenience in the same way PI does not equal exactly 3.14. In reality, 3G cellphones operate within the 2100-2170MHz range and as a result this jammer definitely disrupts 3G mobile phone signals. I know that most jammers can jam 2G signals, so this cellphone jammer can jam 3G signals as well? Definitely. As long the cellphone user is using a 3G cellphone operating in the frequencies between 2110-2170MHz he won't get a signal within seconds of you turning on this jammer. Does this mobile phone jammer poses any health risk issues?